...Before 1855, there was no immigrant processing center. The shipping company presented a passenger list to the Collector of Customs, and the immigrants made whatever Customs declaration was necessary and went on their way. 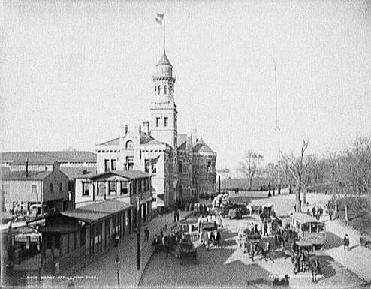 ...From August 1, 1855 through April 18, 1890 they came through Castle Garden (also known as Castle Clinton). The State of New York opened the very first examining and processing center for immigrants on an island off the southwest tip of Manhattan (Castle Garden). Immigration remained purely an affair of State, not federal, government until 1882. The court decision affirming Congressional supremacy over immigration (under the commerce clause) came down in 1875. But Congress did not act until passing the Immigration Act of 1882, which authorized the Treasury Secretary to contract with the states for enforcement of that law. Here is an account of Castle Garden in 1866 from the New York Times Marine Intelligence Column of December 23, 1866. ...A brief item about the Burial of Immigrants appeared in the April 12, 1874 issue of the New York Times. ...From 1882 the reception of immigrants was handled as a joint State/Federal system. The Secretary of the Treasury signed a contract with the New York State Commissioners of Emigration to continue its services at Castle Garden. On April 1, 1890, the Secretary terminated the contract and on April 18, 1890, the Treasury Department assumed total control of immigration at the Port of New York. The New York State authorities refused to allow the federal government to use the Castle Garden facilities. 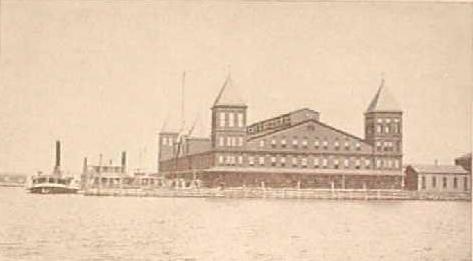 ...On April 19, 1890 the US set up a temporary center in the old Barge Office at the foot of Whitehall Street near the Battery at the southeast end of Manhattan. ...The Office of Superintendent of Immigration of the Department of the Treasury was established by an Act of Congress of March 3, 1891, and was designated as a bureau in 1895 with responsibility for administering the alien contract-labor laws. This agency eventually became the Immigration and Naturalization Service, under the Department of Justice, through February 28, 2003. ...Ellis Island opened on January 1, 1892. An account of its early days can be found in The Illustrated American of July 23 1892. There are 3 large graphics on this page, so it will take a while to load. However, one of them shows the original Ellis Island Immigrant Station, which was constructed of wood and slate, not the familiar brick structure that replaced it, so I believe it is worth the wait. ...Harper's Weekly of August 26, 1893, contained this account of The Detained Immigrant, who was held at Ellis Island pending either admission to the United States or deportation. ...The same issue of Harper's Weekly told of another peril facing immigrants - The National Quarantine. ...Perils began before the ships arrived in America, as related in this New York Times article of September 17, 1894, describing Immigrant Ships In A Hurricane. ...How Food Is Sold At Ellis Island was the subject of a New York Times article on December 13, 1894. ...On June 13, 1897 the original wooden structure burned to the ground. All the administrative records for Castle Garden for the period 1855-1890 and most of the records for the Barge Office and Ellis facilities were lost. Ellis Island's entire collection of state and federal lists were stored there and burned (even the underground record vault burned!). Fortunately, copies of the passenger lists were held by the Customs Collector and abstracts were held in Washington, DC. The Customs lists did not have as much information about passengers as did the Immigration lists, and the fire is the reason that the New York Immigration passenger lists begin with arrivals on June 16, 1897, instead of with 1891 arrivals. Here is an account of the fire and its aftermath from the Brooklyn Daily Eagle of June 15, 1897. ...From June 14, 1897 through December 16, 1900 The Barge Office was reactivated and used until the new Ellis Island facility opened. An account of immigrant processing through the Barge Office appeared in the August 14, 1898 New York Times Magazine. ...Immigration patterns changed over the years. This New York Times article of December 8, 1897, discussed The Influx of Italians. ...The temporary facilities at the Barge Office were far from ideal, as described in the New York Times of June 30, 1900, in an article entitled Abuses At The Barge Office. 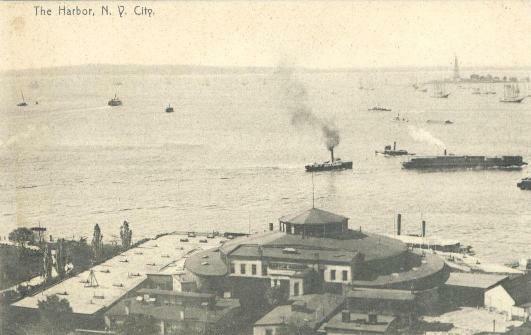 The ferry entering the slip is the Government's ferryboat Ellis Island. ...Plans for the New Ellis Island Immigration Station were discussed in this article from the August 7, 1898 New York Times Magazine. 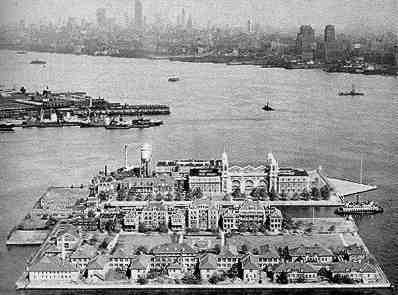 ...The Ellis Island Immigration Station was rebuilt and reopened on December 17, 1900, and immigrants came through Ellis Island until 1924. ...Attitudes about immigration in 1924 are reflected in Stricter Alien Law Has Chance from The Gazette, of Bedford, Pennsylvania of April 18 1924. ...After July 1924, only those immigrants held for hearings physically "went" through Ellis Island. The vast majority were processed on board and did not step foot on the island. Otherwise it was an administrative and detention facility from 1924-1954, with other uses during WW II. All the immigrants' records were filed on the island until 1943, when the NY Immigration District Office moved to Manhattan. After 1943, then, not even the manifests went to Ellis Island. Here is a display of Postcards illustrating the Ellis Island experience. - The Bureau Of Immigration and Customs Enforcement (BICE). The history section of the former Immigration and Naturalization Service Web Site is now part of the BCIS site, and contains much useful information. A brief history of Castle Clinton/Castle Garden can be found at the National Park Service's Castle Clinton National Monument homepage. 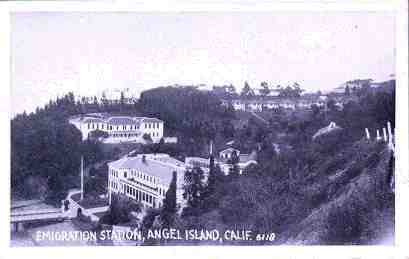 Angel Island - California's "Immigration Station" is my series of pages about immigration into California by Asians. Reproduced from a book published in 1917. Grosse Ile was Canada's "Immigration Station," and is now a Canadian National Park. 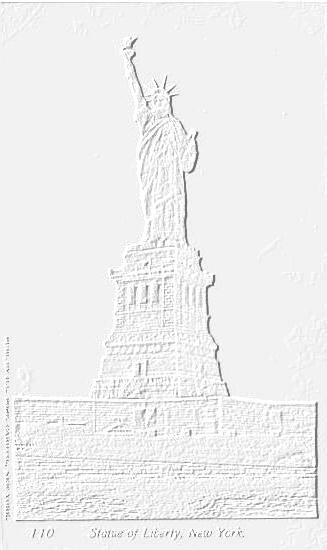 A description of the information found on Immigrant Passenger Lists can be found at the linked portion of my Italian Culture and Genealogy Web site, along with some additional Ellis Island links. Thanks to Marian Smith, Historian of the Immigration and Naturalization Service (now with BCIS), Washington, D.C., for critiquing the original version of this page. Be sure to include your full name, as I will NOT reply to unsigned e-mail.Please do NOT wite from AOL or Compuserve addresses, as they block all emails from ".it" domains.